Hi welcome to just answers my name is Ricardo. this problem is usually cause by carbon deposits on the valves, have you done carbon cleaning on your engine to see if that helps? No but my valves on the passenger side should be new. How do I do a carbon cleaning ? you can get a can at a dealer is called Chrysler Mopar carbon top engine cleaner Run top engine cleaner through the engine when fully warmed up. Shut off the engine and let it sit for 2 hours. Start the engine and run it hard down the road to clear out carbon. it will be good to get this out of the way before we go in to sensor operation, carbon build up on valves play a big part on this problems. yes that is usually the symptoms of carbon deposits on the valves. Start the engine let it worm up, disconnect the brake booster hose and ADD THE TOP CLEANER SLOWLY THRU THE HOUSE AS THE ENGINE RUNS , allow the engine to stall and finish the entire can on it , let it sit for about one hour and restart the engine, at this point the engine will start and hesitate and blow lots of smoke out the tail pipe take it for a drive best at highway speed until it clears out . very careful adding the chemical on thru the the hose , don't go to fast on it ,this will cause hydraulic lock on the engine and cause damage , keep it running to half the can and then add more to make it stall ones it stalls add the rest of the can . let me know how that works out on your fuel trim so we can continue. My local dealer doesn't have it . The one 30 minutes away I couldn't use seafoam ? yes sea foam is also good but takes longer to work see if you add one full bottle on a half a tank and another one right to the engine oil. yes to the engine crankcase . no this one goes on the tank with a half a tank of fuel. If it runs better with the hose disconnected is because the engine is running rich to much fuel or not enough air, and by opening a pad for air now the engine can take air and run better yes if you have a rich condition that is created by your spark plugs failing do to carbon build up this will happen. Give it time to clean the valves and and combustion and lets see what happens the. do I let it sit or keep it running ? it's okay to drive like this with the low idle ? no problem, let me know what the results are OK if that does not work then i have other areas we can check . Hi sorry for the delay . is the problem still there , and is the engine light still on? if the problem continues then lest check cylinder #5 for low compression. do you have a compression tester? all compression good , the car runs great no more codes . I did a head gasket replacement on that side . What about my idle running Normal when I unplug the temp sensor? 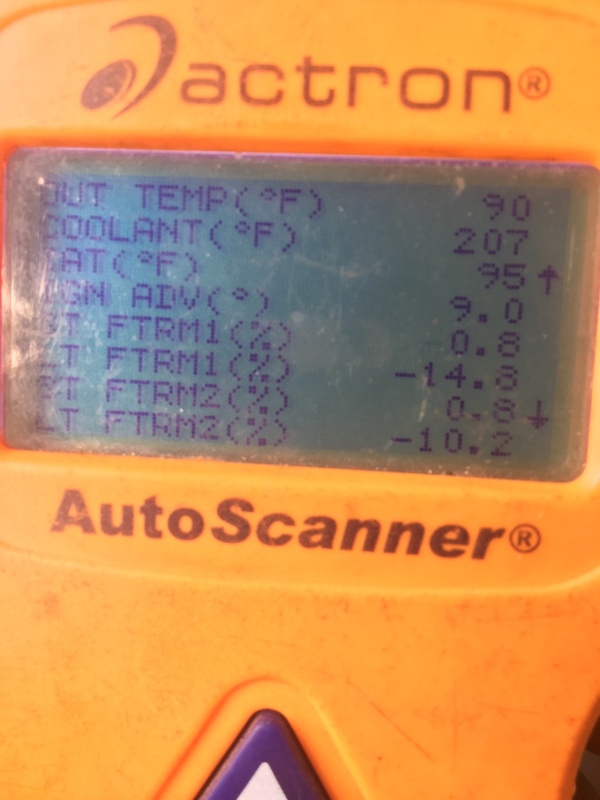 do you have a code indicating a bad temp sensor? are there any codes at all? have you replace your thermostat sometimes they don't close and stays open all the time but this will cause a hi idle. are you still experiencing low idle? is the engine noisy? do you hear the valve train or lower end noisy? if your oil sender is on but you have no noise from the engine even when accelerating then is not an internal problem this can just be the oil sending switch shorted. 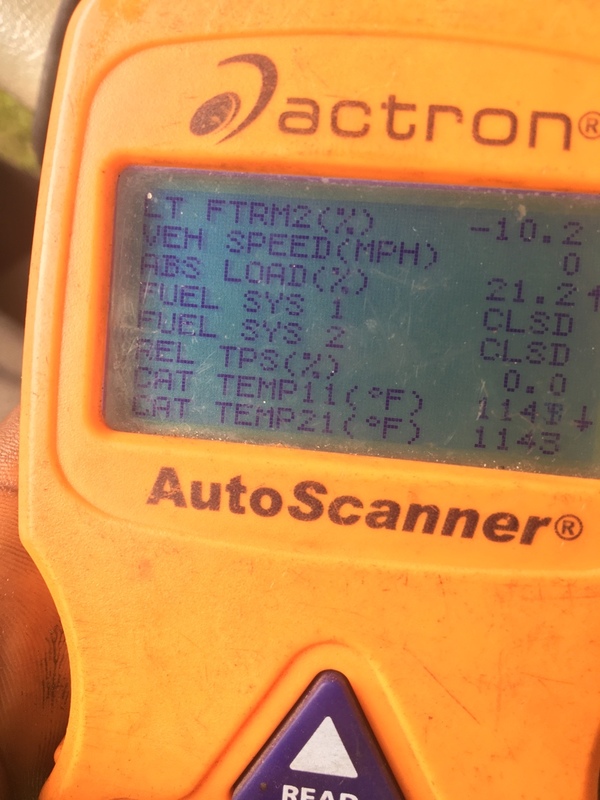 you need a thermostat on the engine this is going to cause the temperature sensor to read wrong temperature is there a reason why you don't have a thermostat? is it overheating? disconnecting the temperature just makes the computer go back to open loop operation this means is at worm up mode. how low the Rpm go? 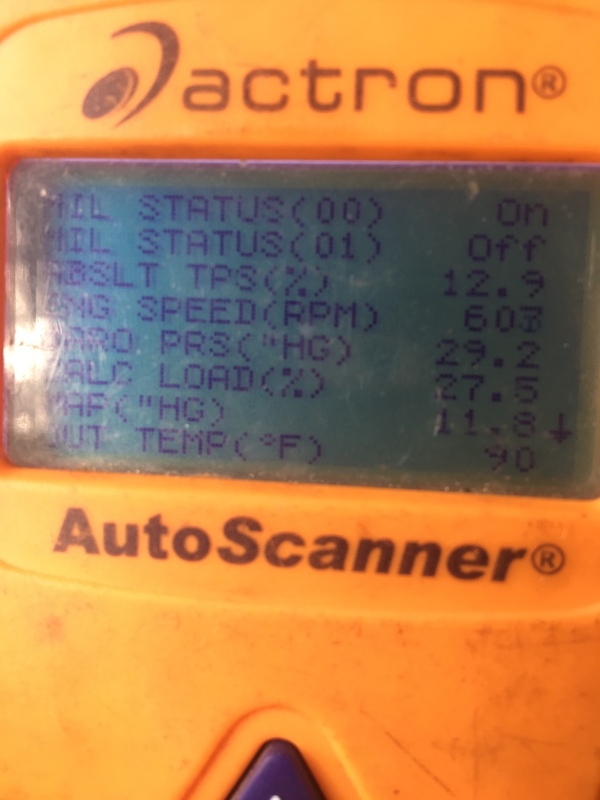 do you have a scanner that reads sensor data to read TPS and idle air control valve? Should be at .65 idle ? the Throttle Position Sensor voltage should be at .65 volts (650 millivolts) at idle. but you need a scanner to see that on sensor data. as to the oil light....this will not cause low idle unless you have a knock on the engine or valve train noise the knock sensor will lower the idle to prevent engine damage. the reason for the oil light can also be that your rpm's are to low to create the necessary oil volume for the oil switch to keep the light off. this will not be a bad oil pump. this is just because of the idle. does the oil light go out if you bring up the rpm's? have you try an oil pressure switch? have you done an oil pressure test with a manual Gage? ok give me some time to look up the data you send me and also on the oil pressure readings and get back to you tomorrow morning if is ok with you. Good i am glad you found the problem it was oil starvation after all , is just strange that the oil pressure switch fail to see "0" pressure. and the fact that there was no engine noise..... it just tells me that we never finish learning. Thank you for the input this is new to me . Have a 2006 Honda Odyssey Touring with ~165k miles on it.